This camera has no name, although it is generally referred to by the initials TCBBC (TSVVS) and this stands for topographical service of the air force. It seems assuredly, that TSVVS camera was produced by Military Plant ALMAZ in Moscow. 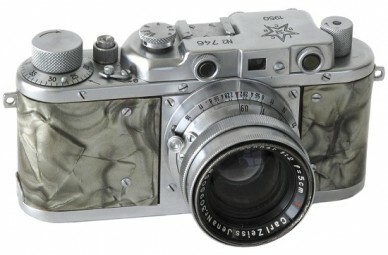 This camera is very well made, having a brass body with a dull nickel finish. The body covering is in natural leather. 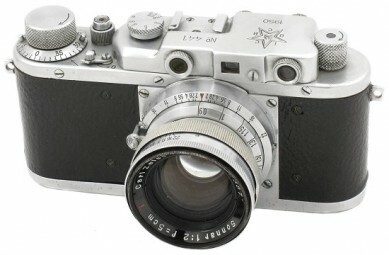 Basically, the camera consists of a Leica type body fitted with a Zeiss lens in a Contax bayonet mounting. It is known under the name of "General's FED". Cameras are usually engraved with a star, with a hammer and sickle in the centre, and the initials TCBBC around the edge. 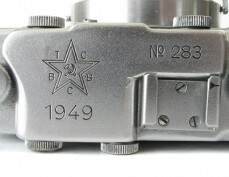 The year of manufacture is also shown, either 1949 or 1950, and a serial number is engraved in front of the accessory shoe. A few examples are known with no engraving at all. Lens: Carl Zeiss Jena Sonnar 2/50. 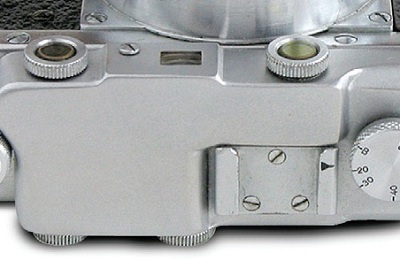 Shutter: 1/20s, 1/30s, 1/40s, 1/60s, 1/100s, 1/200s, 1/500s + B. Camera opposite from Egidijus Tutkus (Lithuania) collection. PH1005. Seems to be an earliest version of TSVVS camera without engravings on the top plate yet. Strap lugs on body. Fitted with Carl Zeiss Jena Sonnar 2/50mm lens. Very few cameras are known to exist. Camera from Yuriy Davidenko (Ukraine) collection. PH1005 - TSVVS No-Name camera. PH1010. 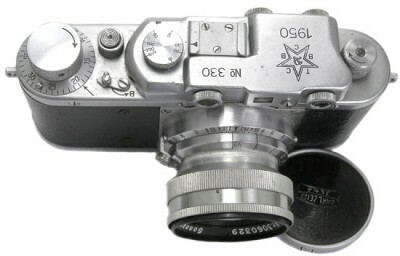 No-Name camera identical to PH1005, but without strap lugs on body. Camera's body is covered in black leather with visible 4 screws on the front plate. Fitted with soviet Jupiter-8 2/50mm lens. 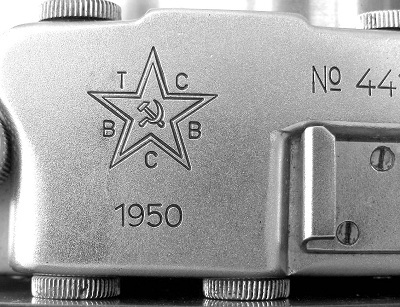 The picture of camera opposite was taken from the book "The Authentic Guide to Russian and Soviet Cameras" by J.L.Princelle, 2nd edition, 2004. PH1010 - TSVVS No-Name camera. PH1015. 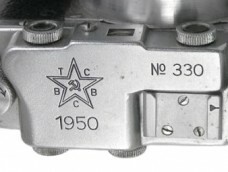 Camera identical to PH1005, but with TSVVS markings on the top plate (see picture bellow). 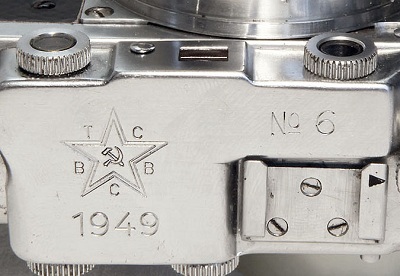 Big year "1949" markings engraved beneath a star with a hammer and sickle. Appr. 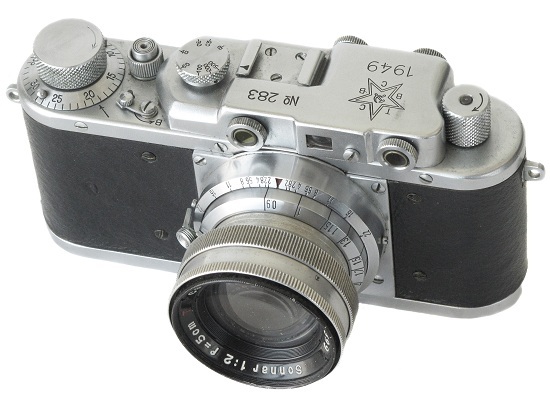 320 cameras were released in 1949. 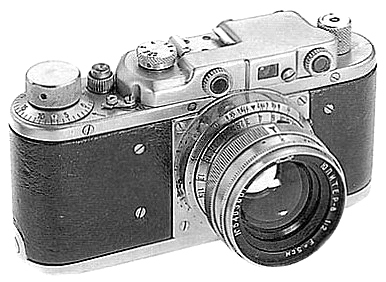 An earliest so far known camera has s/n #6 (private collection in Russia). Camera opposite form private collection in Russia. PH1020. 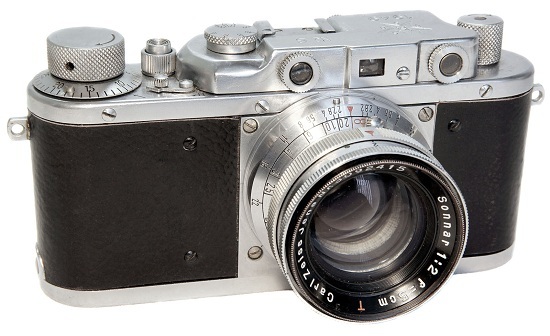 Camera identical to PH1015, but with "1950" markings on the top plate already. 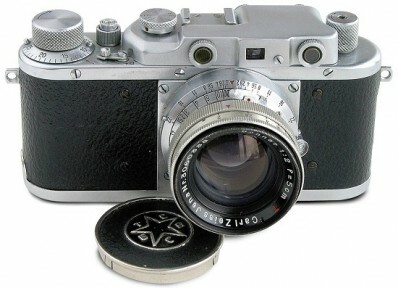 Very uncommon to find, since less than 100 units of this version cameras were released in 1950. PH1025. The most common version of this rare camera. Identical to PH1020, but with significatively reduced size of the "1950" markings on the top plate (see picture below). Appr. 500 cameras released in 1950. An earliest so far known camera has s/n #377 (Molotok 2012). PH1030. An exceptionally rare and the most beautiful version of the TSVVS camera. Body covered in olive drab plastic with "mother-of-pearl" look. At least 3 cameras are known to exist at the moment. The brown leather case is identical to regular TSVVS cases. An earliest so far known camera has s/n #488 (private collection in Europe).